I love weekends. What a fascinating idea weekends are. Two whole days free from work after 5 days on. It's a good combo. I also enjoy those 3-dayers thanks to "holidays" like Memorial Day, President's Day, etc. Supreme. And yesterday here in CNY it was sunny and warm (and by warm I mean in the 50's, yes, that's warm for this time of year). That's a rare combo in these parts: saturday, sunny, and warm all in one day. The first hints that hibernation is coming to an end. People want to go outside and enjoy it before it gets cold again, right? I'm sure most did. 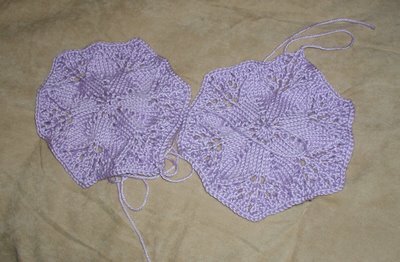 Two full hexagon pieces for Zoe's baby blanket. This is probably the fanciest damn thing I've ever made. 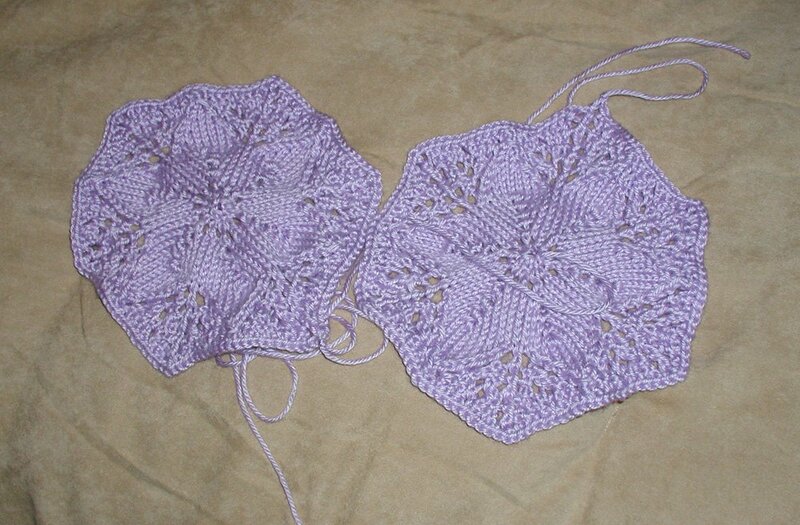 I'll need to make many of these, plus a couple halfies, filler triangles, and the border. But it's a good start. This pattern definately keeps you on your toes, and the results make you want to knit more. But I can savor this. I must savor this. I still have two other projects in queue, one of them being a cozy sweater that may not be finished in time for the last days of winter. So when I knit today, the BWC will be getting my attention. For Sunday beakfast I decided to make on Apple Popover instead of scones. I didn't know what the hell an apple popover was until I found myself at www.joyofbaking.com. They have a lot of inspiring recipes, including "old school" recipes like this popover-thingamajig. It's simple enough to make, it just takes time. But the results are rather pleasing. 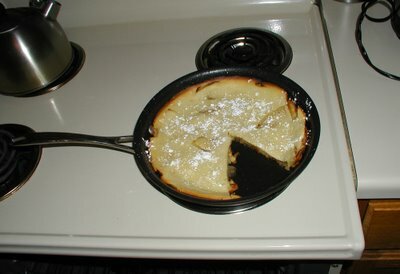 Basically, you saute some apple slices in butter, cinn, and sugar. 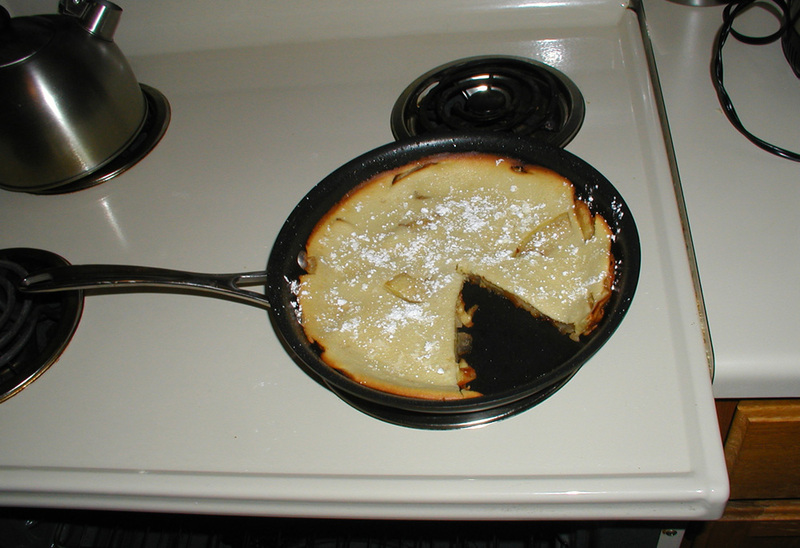 Whip up the batter, pour it over the apples in the skillet, and stick the skillet in the oven for about 20 mins. The edges of the batter rise and brown and also binds the gooey apples together. A sprinkle of powder sugar, and voile! Pretty tasty, not too heavy like my usual waffles and pancakes. This is a good thing since I've been trying to eat lighter these days. Plus, with the ample amounts of fruit make me feel like I'm being healthy (who I am I kidding, they're smothered in butter and sugar!). I'd recommend this. More so than the crepes. Check out that site. I'll be sure to put a link on my sidebar. THat looks really good. I wish I had some food in the house..we are totally out! That blanket is going to be beautiful in that color yarn! I can't wait to see how it progresses. Wasn't this weekend gorgeous!! You're right, 50's is a heat wave for this time of year! Those hexagons turned out awesome. I can't wait to see what it looks like all made up! I wish I had time to make myself breakfast, but I only have time for cereal, etc. I'm one of those unfortunate people who doesn't get a true weekend. It's sad, but it's not permanent! Hey to you cater? That looks a lot better than my Froot Loops! Don't worry about the butter and sugar....stick with the "its good for me cause there's fruit in it" part. Love the blanket hexers too. What happened to the sunshine and warmth? I can't believe it's March 15 and it's snowing. The apple thingie looks delicious and so do the hexes. The blanket looks great so far! I'm moving to Syracuse in July - any good LYSs?